In order to keep pace with never ending demands of customers, our company is engaged in offering High Pressure Air Compressor. 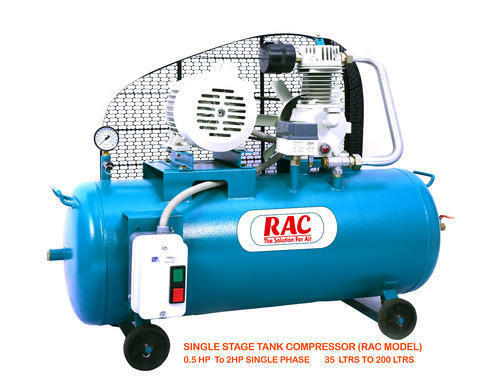 This High Pressure Air Compressor is designed by using sharp edge technology and checked for quality under various norms set by the industry. Furthermore, our product range is available in different standards. Sree Renuga Engineering Works was incorporated in the year 1999 as Sole Proprietary firm. We are prestigious Manufacturer and Supplier of Air Compressor, Automatic Valve, Borewell compressor, Pressure Switch, Air Receiver, FRL Unit, Pneumatic Compressor, Grease Pump and many more. While carrying out production we focus our attention on quality of material used. For this purpose we contract with reliable vendor base. Periodic inspection at vendor place is maintained. Through regular contact with vendor we assure that quality of material is upgraded. Vendor is selected after cross checking his credibility, delivery schedules, financial stability and many other similar perspectives. Material not adhering to the set terms and conditions is rejected.